Recently, the makers of Tamil superstar Ilayathalapathy Vijay’s much-awaited film announced that the film has been titled Mersal. Fans went gaga over the mass title. Now, the title for Mersal’s Telugu version is out and it is equally exuberant. 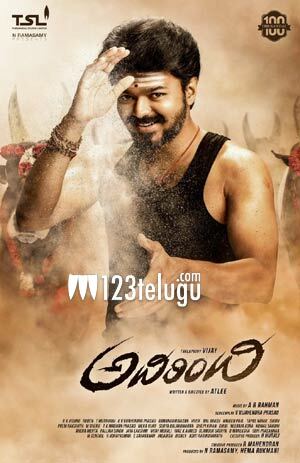 Mersal’s Telugu version is titled Adirindhi. Going by this early announcement, it looks like the film is going to have a simultaneous release in Telugu along with the Tamil version. Vijay will be seen in three different roles in this movie. Young filmmaker Atlee is directing the film and Kajal, Nithya Menon and Samantha are playing the female leads. AR Rahman is scoring the soundtrack for this movie, while Sri Thenandal Films banner is bankrolling its prestigious 100th project.